Way too much of - maybe - a good thing. Dockless meant lower barriers to entry,plus a higher reliance on technology - and personal probity - never a sure bet. 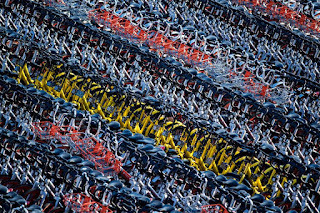 40 bike-sharing companies have popped up, creating a picture in Chinese cities of ride-sharing bikes left in heaps of colorful piles. More than two million bikes were available for sharing from 15 companies in Beijing alone. Competition solidified pricing in China at a rate of 1 RMB ($0.15 USD) per 30 minute trip, which is below the cost of operating. In other markets memberships will become common, as alternative business models will have to rise up to replace per-ride fee. Dockless bike-sharing has exploded in just a couple of years, spreading to dozens of Chinese cities seemingly overnight. The incredible growth was fueled by a massive injection of venture capital, creating two startup unicorns in less than two years: Ofo, a three-year old dockless bike sharing company, had raised over $1.2 billion USD, and Mobike, which pulled more than $900 million in venture capital. 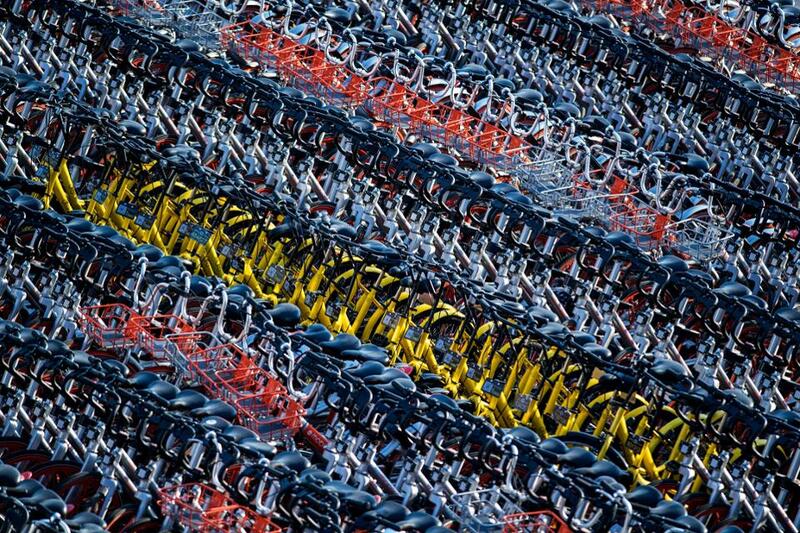 In that same time, no less than 40 bike-sharing companies have popped up, creating a bizarre picture in major Chinese cities of ride-sharing bikes left in heaps of colorful piles. According to Xinhua news agency, more than two million bikes were available for sharing from 15 companies in Beijing alone, creating a burden for municipalities in China that were struggling to contain the explosive growth in a new industry. Now, dockless bike-sharing is spreading to other countries. Both Ofo and Mobike are expanding aggressively abroad, launching in Japan, Singapore, Europe and North America. In July, Ofo claimed to have 6.5 million bikes in its global network. Not only are these Chinese companies competing against each other, but also against local players. A number of well-funded competitors have established themselves in North America. LimeBike, based in San Francisco, raised $12 million from Andreessen Horowitz earlier this year (disclosure: Andreessen Horowitz also funded my startup 500px) and just a half a year later, closed another $50 million from Coatue Management. Meanwhile, Spin raised $8 million led by Grishin Robotics. Entering unknown territory can sometimes arise in problems. Chinese company Bluegogo, which raised $90 million to date, deployed its bikes in San Francisco earlier this year, but did not seek a permit first. The city threatened fines and legal action, and the bikes were promptly pulled from the streets. The local companies, Spin and LimeBike, approached their home markets differently. They sought permissions from municipalities and were able to launch in Seattle. The city recently permitted both companies to recently expand their fleets to 3,000 bicycles each. But that didn’t stop Chinese company Ofo from expanding to Seattle as well. It entered the fray in August of this year, and now operates a fleet 2,000 bikes there in its first North American expansion. With so many funding announcements and expansion plans, many pundits have questioned whether the whole segment has been growing too quickly too fast. In the middle of November, news broke that Bluegogo had an empty office, and employees claimed their wages hadn’t been paid. By last count, Bluegogo had deployed between 350,000 and 700,000 bicycles, and was estimated to have 20 million users, all of whom have paid 99 RMB ($15 USD) deposits to use the service. Bluegogo was thought to be one of the most viable contenders in the space along with Mobike and Ofo, and was often quoted as the third most popular bike-sharing company in China. That didn’t stop the collapse. And the deposits, estimated as high as $300 million dollars, are unlikely to be repaid. A week after news broke on Bluegogo, another company folded in turn. The South China Morning Post had reported that Mingbike, which conceded to competing in Shanghai and Beijing earlier this year to shift focus on third and fourth tier Chinese cities, fired 99% of its staff. Yet another company, Coolqi, with a reported fleet of 1.4 million gold-colored bikes deployed in China, is now looking for a buyer. Its 1.5 million registered users have paid a 299 RMB deposit, putting an estimated $67 million in deposits in jeopardy. Having 40 bike-sharing companies in China doesn't help. Ten thousand bikes each for two operators is more than twice as useful as 5,000 each with four operators, says Qiming Weng, founder and CEO of Dropbike. The competition more or less solidified the pricing in China at a rate of 1 RMB ($0.15 USD) per 30 minute trip, which pundits believe is below the cost of operating. In other markets, Weng believes, memberships will become increasingly common, as alternative business models will have to rise up to replace per-ride fee. There remain, however, thousands of cities without “free floating” bike sharing options. Most of the world is not even close to saturation in terms of number of shared bikes, free floating or not, says Weng. For mid-size cities, arrival of bike-sharing has a clear benefit. A Canadian bike-sharing company Dropbike had placed bikes in a city of Kingston as part of a test rollout, providing 100 bikes for a city with a population of 129,000. Such cities are small enough to enable sustainable business model, and their size is naturally restricting competition. For the players in the larger market, however, there will be a lot of bikes to dispose of in the coming year. The scale and potential market of large cities attract companies to deploy their fleet. Dozens more startups are now on their path to implode, as competition is playing winner-takes-all strategy and leaving even players as large as Bluegogo was broken and devastated. And with a bigger threat looming over -- if the merger of Ofo and Mobike happens next year -- it will mark the end of life for many smaller players.